Sarah McQuaid might live in Cornwall these days, but it’s hardly surprising that her inner troubadour regularly urges her to get out on the road. A quick skim through her formative years reveals the origins of a nomadic streak that will only be satisfied by taking her distinctive, guitar-driven stories directly to a rapidly growing audience – wherever it happens to be. She was born in Madrid, the child of a Spanish father and an American mother, raised in Chicago (the touring bug struck early – McQuaid was a member of the city’s Children’s Choir, which travelled widely across the North American continent), and made regular visits to her grandmother’s home in Indiana. When Europe called, she spent a year studying philosophy at the University of Strasbourg and eventually arrived in Dublin in 1994, where she lived for 13 years, carving a career as a music journalist and dabbling in songwriting, before moving to England in 2007. McQuaid says the reasons that she now calls Cornwall ‘home’ were initially purely utilitarian: when her mother died, she took over her house – which then became the natural place for Sarah and her husband Feargal Shiels to settle down and raise their own family . But she also appreciates the county’s significance in her evolution as a musician. The two women formed a folk duo, Mama, and released an album in 2008. “I’d made records before that [she released her first album in 1997] and if a song came to me I’d write it, but it was never something I specifically sat down to focus on. But the whole process of working with Zoё filled me with energy and I thought this was something I could actually do, write my own songs for a career. It was the first time I started to think about myself as a songwriter,” she says. It was also, clearly, the foundation for McQuaid’s status as a rising star in the UK’s eclectic galaxy of notable singer/songwriters. She has just released her fourth solo album, Walking into White, self-penned apart from a fresh, unadorned cover of ‘”The First Time Ever I Saw Your Face”. It showcases a quiet confidence in her skill as a lyricist, a commitment to her craft that is maturing at an opportune time, and a diversity of influences.ranging from lullabies and Latin beats to traditional folk and ballads of quality. McQuaid’s voice has an unforced richness which is the perfect foil for the echoing, spacious arrangements of her songs – and for her guitar, which here assumes a dazzling array of guises; one minute it’s as plangent as a piano, the next, it’s buzzing on a rock-an- roll riff. A unique, multi-textured sound emerges as each song pours out a new narrative. A melancholy trumpet gives an imaginative edge to many of the songs. When we speak, she has just returned from an extensive visit to the States and is already planning her next set of UK gigs. This will lead into a European leg and eventually to a full-scale spring tour of Britain, and you can sense her eagerness to get out there and recreate the acoustic idiosyncrasies of the album in an endless variety of live settings. That considerable task weighs on the shoulders of her manager and touring sound engineer Martin Stansbury who helped with creative direction on the album, co-produced by McQuaid’s cousin Adam Pierce and Jeremy Backofen. Her professional hook-up with Stansbury was another key influence on her progress as a fully-fledged singer/songwriter. The US tour was an exhausting success, which taught McQuaid a few logistical lessons. “I’ve been touring since 2010 so this is my fourth year and I feel like I’m finally getting it,” she says. “My tip for every travelling musician is to buy nuts and put them in zip-sealed bags! I love it. The way you settle into the rhythm and life actually becomes very easy. You get up, drive, stop for an interview, check in to your hotel, do your sound-check. It’s almost military in its precision. Home is also the source of a lot of McQuaid’s inspiration: three of the songs on the new album were inspired by Arthur Ransome’s Swallows and Amazons books, which she discovered through bedtime reading sessions with her husband and their two children, and she would always catch up if a gig meant she missed a chapter. “Because I grew up in the States I hadn’t been aware of them – my contribution has been Laura Ingalls Wilder’s Little House on the Prairie books. I love children’s literature. E. Nesbitt is another favourite,” she says. These tracks are among the most magical on the album, taking the listener into a world of metaphors and life experiences. The ‘white’ of the title isn’t necessarily innocence – it could be a blizzard full of danger; and there is plenty of shade in McQuaid’s evocative lyrics. 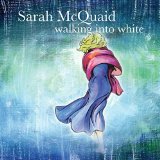 McQuaid, however, intends to carry on doing both, and perhaps it’s a sign of her growing confidence that she included the Ewan MacColl classic on Walking into White. And with that, prompted by her manager, she has to call time on our conversation. The road beckons, and there’s another destination to reach before McQuaid reels in another audience in thrall to her sonic way with a story.